Synthetic peptide within Human Aspartyl Aminopeptidase. The exact sequence is proprietary. Our Abpromise guarantee covers the use of ab154805 in the following tested applications. WB 1/1000 - 1/10000. Predicted molecular weight: 52 kDa. 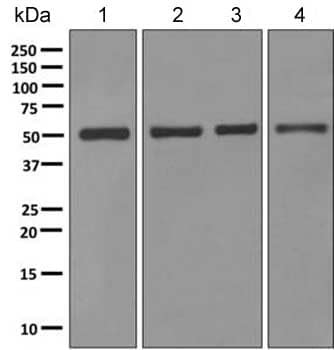 Is unsuitable for ICC/IF or IHC-P.
Aminopeptidase with specificity towards an acidic amino acid at the N-terminus. Likely to play an important role in intracellular protein and peptide metabolism. Belongs to the peptidase M18 family. 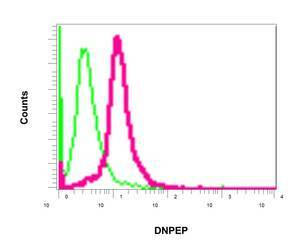 Flow cytometric analysis of permeabilized 293T cells staining Aspartyl Aminopeptidase using ab154805 at a 1/10 dilution (red) or a rabbit IgG (negative) (green). Publishing research using ab154805? Please let us know so that we can cite the reference in this datasheet. There are currently no Customer reviews or Questions for ab154805.